Likely taken with Pentax Medium Format camera on an Astro-Physics Traveler refractor. The center of the Milky Way with the Lagoon and Trifid nebulae, M8 and M20 respectively. Image acquired with Pentax 6x7 on Astro-Physics Traveler and E200 transparency for 60 minutes. Center of the Milky Way from New Mexico Skies featuring M8, M20, M21, M24, NGC 6554, and NGC 6559. Image acquistion with Pentax 6x7 and 300mm lens at f5.6 on Kodak E200 transparency for 90 minutes on AP600 mount. Amazing dark nebula commonly called the Pipe Nebula or Prancing Pony featuring the sinuous dark nebula called the "snake". Image acquired at Sunglow Ranch, AZ in May 2003. AP Traveler at f6 on AP 600 mount on Fuji Provia 400 film for 60 minutes with a Pentax 6x7 camera. Star Cloud M24 and Swan M17 from New Mexico Skies in 2003. Image acquired with Pentax 6x7 on Astro-Physics Traveler at f6 for 60 minutes on Kodak E200 transparency. A portrait of the Sagittarius constellation from the highlands of New Mexico Skies. Image acquisition with Pentax 6x7 and 105mm lens at f4 for 40 minutes on Kodak E200 transparency. The spectacular Orion region featuring M42, NGC1977, NGC1981, Flame, and Horsehead nebulae. Image acquired with Pentax 6x7 on Astro-Physics Traveler at f6 on Kodak E200 two exposures times 70 minutes at Grayson Lake State Park. One of the highlights of the night sky in Orion constellation. Image acquisition with Pentax 6x7 on a combination of E200 and Provia 400 film through an Astro-Physics 130EDT at f6 from Chiefland, FL and Huntington, WV in 2001. The planet Venus slides across the solar disc at sunrise at Myrtle Beach, SC. Technical details: Taken when film had the edge in dynamic range, Fuji NPS 160 film was used to capture the entire scene at 1/500 exposure and then scanned on a Nikon 8000 scanner. The camera used was a Pentax 6x7 through an Astro-Physics f6 Traveler telescope with a focal length of 600mm. A Wimberly Mount also proved to be most useful. 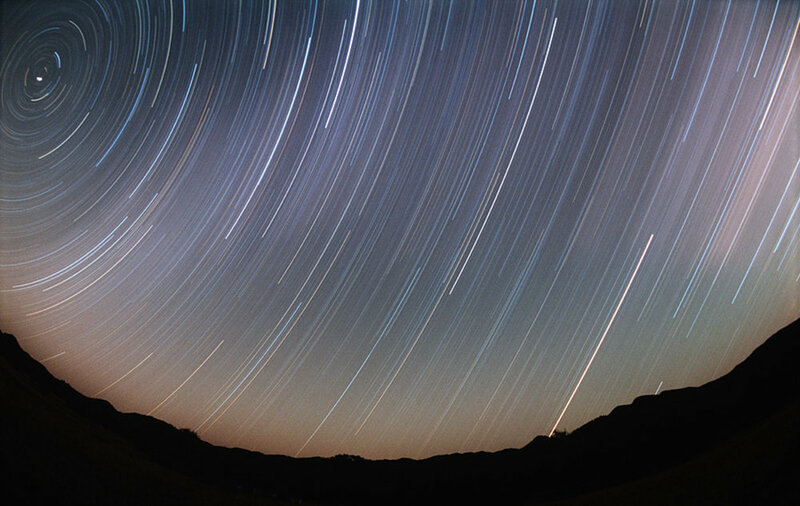 The date of this unique astronomical event was June 8, 2004. A beauty of a night at Sunglow Ranch, AZ. Likely a one minute capture with Nikon camera and Kodak E200 transparency. 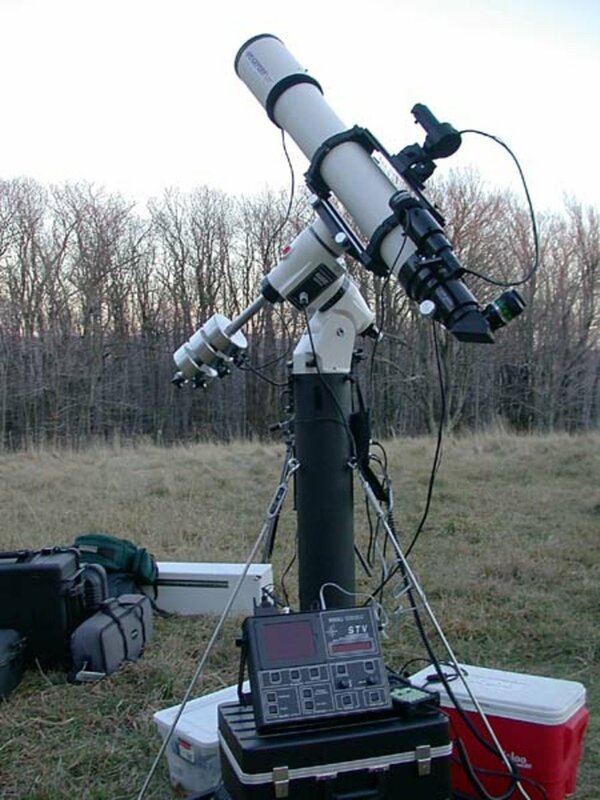 This is the film-based astrophotography setup in November of 2001. We are setup at the Gatewood campground near the summit of Spruce Knob, West Virginia's highest point at just over 4,800'. It was a fantastic spot for photography, but we have since found a few more convenient locations with similar sky conditions. The gear is an Astro-Physics 130EDT refractor on an Astro-Physics 600QMD mount. I used the SBIG STV and eFinder for autoguiding. I used the AP focal reducer to bring the scope to f6 and utilized Kodak E200 and Fuji Provia films.